Summary of the Industrious Hygienist's article in Professional Safety. 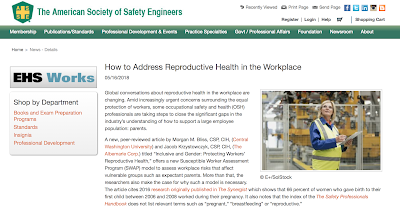 The webpage is entitled "How to Address Reproductive Health in the Workplace" and is a summary of one of my co-authored research articles. 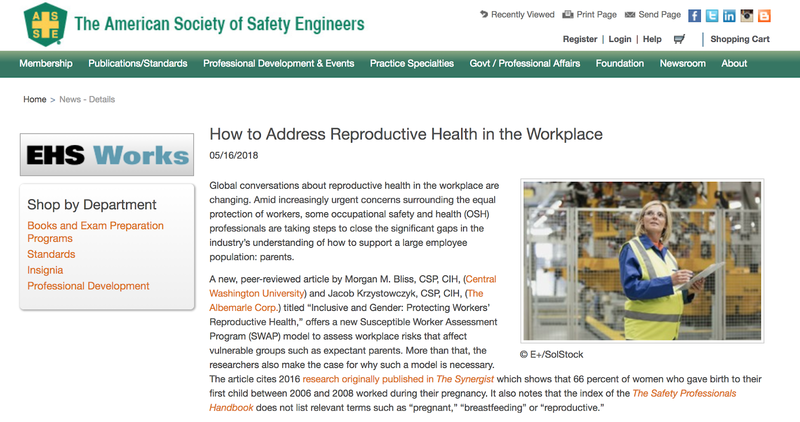 I'm excited to see the article I co-authored with J. Krzystowczyk in ASSE's Professional Safety magazine is continuing a conversation about protecting susceptible workers in the workplace. I learned that the additional attention is due to this week being National Women's Health Week (#NWHW). The definition of "susceptible worker" we developed for the research article is based off the Frank R. Lautenberg Chemical Safety for the 21st Century Act (2016) TSCA updates. TSCA provides a definition of �potentially exposed or susceptible subpopulation� as a subpopulation with a greater risk than the general population for adverse health effects relating to chemical exposure. A potentially exposed or susceptible subpopulation can include infants, children, pregnant women, workers, and the elderly. The proposed Susceptible Worker Assessment Program (SWAP) we developed is intended to provide inclusive, gender-equal, and age-equal protection to all workers. My co-author and I are working on refining the program and making it user-friendly to the everyday occupational health and safety (OHS) professional in the U.S. We found some similar research from Frey, Schuster, Oberlinner, Queier-Wahrendorf, and Yong that supports the basic idea of this program. Yo, it�s been a while. I can officially say that my second year as an academic was in no way easier than my first year, even though I had most of my classes already prepared. I found other things to fill the time I thought I would have � most of the things were some form of service or volunteering. I spent the morning hand writing thank you cards (yes, I am someone who still does that!) to my guest speakers from winter and spring quarter, and was reflecting on how important volunteer work has been to my growth as an occupational health and safety (OHS) professional. Back in 2010, when I was four years out of college and just getting a handle on my career, my local Arizona Chapter of the American Society of Safety Engineers (ASSE) had a Healthcare Section. The primary clients I served as an OHS consultant were healthcare facilities, so I started out as the Secretary of the Healthcare Section and then became the Chair. In this role, I learned how to use MailChimp, how to take decent meeting minutes, how to market our educational meetings to members and non-members, and had the opportunity to network with healthcare OHS professionals from all over the U.S.
After almost four years in that role, I switched my focus to volunteering with the Industrial Hygiene Practice Specialty (IHPS) of ASSE, starting as their Social Media and Website person, and moving into the Publications Chair role after a year or so. In my three years as Publications Chair (now called the Content Coordinator), I became proficient with LinkedIn networking, soliciting articles from members and non-members for our web-based publication, writing articles for the publication, editing submitted articles for the publication, and understanding the role of social media in OHS advocacy. Within IHPS, I have served (officially and unofficially) in many roles, but my favorite role was Executive Secretary � it felt like I was at the heart of everything IHPS was doing. As Executive Secretary, I kept the minutes from our Volunteer Advisory Committee meetings and was able to help organize and participate in two free webinars (we call them �open calls�) for our membership, one on healthcare safety and another on hazardous drugs handling, spill clean-up and exposure assessment. I was also able to help with ASSE�s comments to NIOSH about the occupational exposure banding guidance. Thanks to my involvement in IHPS, I was able to participate in the House of Delegates and Council on Practices and Standards (CoPS). I was also selected to speak at Safety 2016 in Atlanta and Safety 2017 in Denver. I don�t know if I would have been brave enough to submit a proposal to speak if I was not so involved in ASSE. Thanks to the local and regional events I spoke at in Arizona, I felt I was ready to take things to the next level. In 2016, I took on an even more daunting role. After losing the election for Assistant Administrator for IHPS, I emailed ASSE staff and asked them which practice specialty needed help � where my efforts could do the most good. I ran for Assistant Administrator of the Training and Communications Practice Specialty (TCPS) and won. I take over as Administrator of TCPS in July 2018, which is pretty exciting. In 2016, I also moved away from my Arizona ASSE Chapter, where I had many friends and contacts, to join Central Washington University (CWU). I became a member of the Puget Sound ASSE Chapter. Since their meetings are in the early mornings in downtown Seattle, I haven�t been able to attend due to my teaching schedule, but I spent the last two years on the Puget Sound ASSE Professional Development Conference (PDC) planning committee. Being part of the planning committee has helped me network with local OHS professionals, and I was lucky enough to co-present at this year's conference with the incredible Jeff Dalto of Convergence Training (recap and details here). This year, I served as the Faculty Advisor for my CWU ASSE Student Section, helping them organize guest speakers, volunteer activities, and interest other CWU students in safety. We submitted an application for the Outstanding Student Section Award (OSSA) and were #3 out of 19 qualifying schools. We conducted a personal protective equipment (PPE) drive with CWU Safety and Health Management alumni from Mortenson, sending 3 packed boxes of PPE to the University of Puerto Rico to help with hurricane reconstruction efforts. Why the long post sharing my experience volunteering for ASSE? I�ve been volunteering for 8 years now, and I�m looking forward to the next 8. Or 20, or however long my professional career in OHS lasts. I want to encourage the next generation to get involved with ASSE early in their career, like I did, and reap the personal and professional benefits. All of the skills I obtained through my volunteer work have benefited my career. If it hadn�t been for some careful nudging by my various mentors through the years, I might not have �put myself out there� and started volunteering. The Industrious Hygienist is back and more determined than ever! The course I am currently enrolled in for my EdD in Health Professions from A.T. Still University is EDUC 7500: Technology and Educational Transformation. As part of the course activities, I had to create an "interactive and informational" resource for tracking educational technology ideas, tools, and articles for an online undergraduate course I am revising about incident investigation and analysis. I decided to complete this activity using Google+ Collections. "Safety Education & Training" is now a public collection of links, tools, ideas, and other activities associated with undergraduate and graduate safety education and workplace safety training. 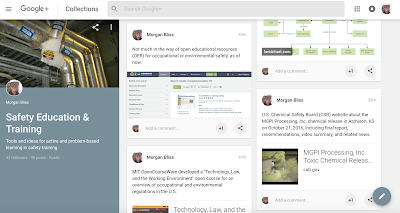 The Industrious Hygienist's new "Safety Education and Training" Google+ Collection. I'll be keeping the resource active and cross-posting useful information on this blog. Hopefully, I find some time to create some open educational resources (OERs) for occupational safety education, since there's not much out there except information from U.S. Occupational Safety and Health Administration, U.S. Chemical Safety Board, U.S. National Institute for Occupational Safety and Health, and the International Labour Organization. Search of the OER Commons showed only a few resources related to occupational safety. A safety hazard recognition game that is freely available to all employers and safety trainers for use. This group has 6 freely available interactive safety training practice exercises that safety students could learn from. Sincere apologies for the months-long delay between posts. 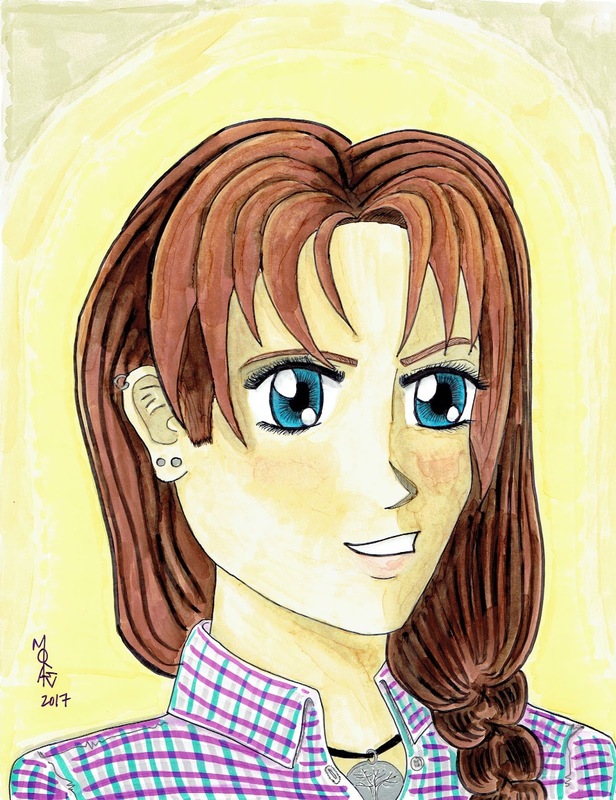 I don't really have an excuse, except the last few months have been busy with work, writing, and attempting to learn how to use my new manga markers. I'm stuck trying to figure out what this blog should become, now that I'm not consulting anymore. When I figure out what this blog is, I'll feel a bit less anxious about it just sitting on the internet, gathering a tiny amount of views. I'm more or less over drawing the Industrious Hygienist (#industrioushygienist) mangas for now. While there are a ton of consulting malarkey stories I still need to tell, I'm not a good enough manga-ka right now to do them justice. Plus, as I've noted before, I'm still slow at the drawing, inking, and coloring, so each 8.5"x11" page takes me 6 to 8 hours from start to finish. Currently, I don't have that kind of time on the weekends. My point of pride for the end of the year: I went on a Naruto (#naruto) and Bleach (#bleach) anime spree over winter break. I'll blame the fact that I was sick for 8 days right after winter break started and I'd submitted grades for my classes. Trying to figure out the jutsu hand seals while hopped up on Day-Quil is ... funny and surprisingly difficult. Turns out that I am not very coordinated on cold medication. It was strange to try and explain to my parents and grandparents that I was not just "watching cartoons" and this is completely normal behavior for adults in Japan. As is my habit, I like to spend New Year's Eve doing something I don't normally have time to do, while pondering how the year went. I started out drawing one of my characters from a short story, but it somehow became a manga of me. I didn't realize it until I was drawing the necklace, so that was sort of weird, but nice to be in the "flow" of the art. The new markers are fun to use! The Industrious Hygienist in her "professor" look. Yes, that is a flannel shirt - we're in the PNW, after all. I'm officially a published author - thanks to @dreamingrobotpress for their awesome 2018 Young Explorer's Adventure Guide and the opportunity to share my short story, "On the Lam on Luna" with middle grade readers. I submitted another short story yesterday to the 2019 Young Explorer's Adventure Guide. It was co-written by me and the exceptional spouse, and is awesome. We hope they like it. I started a doctorate in March 2017 and have completed 3 classes so far. It's a Doctor of Education (Ed.D.) in Health Professions from A.T. Still University. I have all A's so far, but am dreading the quantitative analysis (statistics) course. I started my second year of working as an Assistant Professor of Safety and Health Management at Central Washington University. Contrary to what I believed last year, the second year has not been easier and I've been working harder than ever. 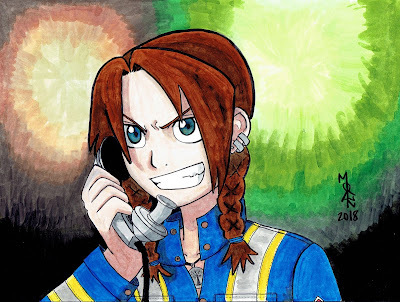 I bought almost 4 hours of J-pop music (mostly songs from Fullmetal Alchemist: Brotherhood, Naruto, Bleach, and Vampire Knight) and have the tunes and sounds memorized. Now on to trying to learn some Japanese. I bought a new oven (ours died a slow death) and am not worried about giving myself food poisoning from undercooked food anymore. I started exercising at least four times a week, getting up at 5:30am to be ready for work by 8:00am. Imagine me on a mini-trampoline, watching anime while I jump around like a goofball. I've been boxing too, which is a very satisfying experience. I spoke at Safety 2017 (annual professional development conference for the American Society of Safety Engineers) with a colleague. Our proposal to speak was not accepted for 2018, so I'll be staying home from conferences next year. I plan to spend the entire summer writing, drawing, and playing the piano, violin, and clarinet. Maybe a little bit of class preparation, but only enough to not feel stressed when fall quarter starts again. There are probably some other things that I've forgotten to list, but those are the big ones. My realistic goals for 2018 are to: 1) keep getting A's in my doctorate classes, 2) finish the historical fiction book(s), 3) keep exercising, 4) take a real vacation with the exceptional spouse, and 5) figure out what this blog is going to be. Perhaps I'll also determine my manga style and get better at drawing with some more practice. For my birthday, I bought myself some new manga markers with the Amazon gift card my parents gave me. I am so excited to learn how to use them! I also bought some new manga paper to see how it differs from the multipurpose computer paper I usually use. Rather than be reasonable and practice in short sessions with the markers and paper, I dove in and recreated one of my favorite panels from my other favorite manga/anime: Vampire Knight. It turned out better than I anticipated, so I decided to post it as a new milestone in my mangaka journey. Yup, I am aware the Day Class uniforms are black. At the moment, I only have a weird mix of primary colors and grays. No black marker in the set. So I improvised with blue! Same with Yuki's hair color, improvised with the sienna brown marker I have. Character names are Zero and Yuki, brought to you by the incredible Matsuri Hino. Therefore, this is fan art...while I try to figure out my own style. The paper I purchased does NOT let you erase once you have inked, so I'll be looking for a different long-term paper. Hence the pencil marks. I hope you enjoy the new art, which will be posted sporadically as I find time on weekends between teaching, my doctorate studies, and life in general. 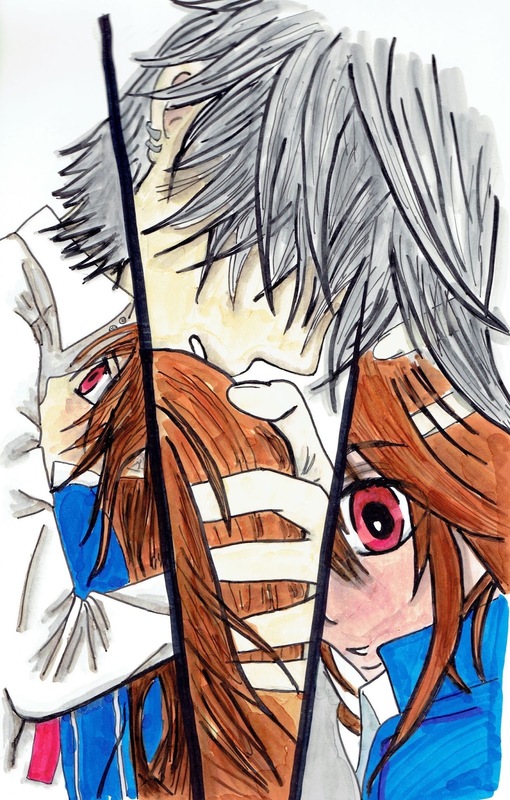 Yuki and Zero from Vampire Knight. I anticipate that my own art and characters will be a hybrid of Hiromu Arakawa + Matsuri Hino + Hayao Miyazaki, since they are the artists I enjoy the most. This post is a continuation of the series on TSCA and exposure assessment. Today�s topic is risk evaluation, including the prioritization process for EPA. 15 CFR 53 Part 2605 explains how, once the U.S. Environmental Protection Agency (EPA) Administrator determines that a chemical substance or mixture presents a risk, the Administrator can apply one or more requirements to the substance. The EPA has released a risk-based screening process which will be explained in detail in a later post, but basically delineates chemical substances and mixtures as high-priority or low-priority. Only high-priority substances undergo risk evaluation at this time, and this is anticipated to a be a 3- to 3.5-year process. EPA must consider the hazard and exposure potential of the substance, including persistence and bioaccumulation, susceptible subpopulations, storage near drinking water sources, and whether there are conditions of use or volumes that are of concern. A chemical substance submitted to EPA should have prioritization conducted within 9 months to 1 year. EPA will start with the chemical substances previously identified in the TSCA chemical work plan and then move on to other chemicals. EPA has 3.5 years to start conducting risk evaluations on 20 other high-priority substances, with preference given to chemicals on the 2014 update of the TSCA chemical work plan that are persistent, bioaccumulative, carcinogenic, or toxic (acute or chronic effects). An interesting quote from 15 CFR 53 Part 2605 (b)(2)(c): �The Administrator shall continue to designate priority substances and conduct risk evaluations [�] at a pace consistent with the Administrator to complete risk evaluations [�]� (emphasis added). So, basically, EPA gets to set its own pace on this. Another interesting requirement is that risk evaluations of metals and metal compounds must use the Framework for Metals Risk Assessment of the EPA�s Office of the Science Advisor (2007) or its successor document. 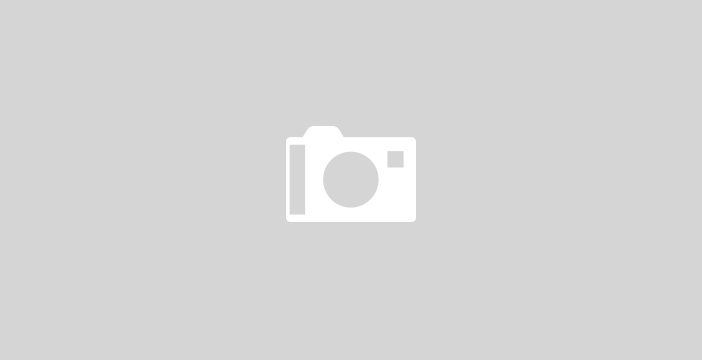 �Aggregate� and �sentinel� exposures are not defined in the regulation. EPA further complicates this by using �aggregate� and �cumulative� in their website about exposure assessment tools being used. This is seemingly contradictory, since the risk evaluation is supposed to be conducted without consideration of costs, but the final risk evaluation must consider costs and other economic consequences�it also requires the Administrator to consider if there are technically and economically feasible alternatives available before releasing a final rule on a substance. This post is a continuation of the series on TSCA and exposure assessment. Today�s topic is manufacturing and processing notices, including the requirement to protect against unreasonable risks. How does the Administrator determine if use of a chemical substance is a significant new use? First, the Administrator receives the notification from the manufacturer or processor. Second, the Administrator considers all relevant factors. What are the �relevant factors� for consideration? If the chemical substance or significant new use does NOT present an unreasonable risk according to the relevant factors, the manufacturer or processor can commence their activities. Another word that is not defined in this regulation is �substantial� � What is a substantial quantity? What is a substantial exposure? What threshold quantity lists or exposure limits are being used to assess this? The information is not provided in the regulatory text (so far). What happens to the information submitted by the manufacturer or processor? 2604(b)(3) states that any information submitted to the Administrator as part of an intent to manufacture or have a significant new use of a chemical substance �shall be made available [�] for examination by interested persons.� Such information, per Part 2613(a), does not include information that is exempt from disclosure (i.e., confidential information). However, if the manufacturer or processor mixes information that is protected from disclosure with information that is not protected from disclosure, it can be shared with interested persons upon request. Health and safety studies for products offered for commercial distribution and chemical substances or mixtures that the Administrator required testing and notification on are also not prohibited from disclosure. Disclosure of formulas (including molecular structures), processes used in manufacturing or processing, or portions of mixtures are not part of this authorized disclosure process � these fall under the confidential information protection. However, manufacturing volumes or ranges or volumes are not prohibited from disclosure. General descriptions of a process �used in the manufacture or processing and industrial, commercial, or consumer functions and uses of a chemical substance, mixture, or article containing a chemical substance or mixture� are also not prohibited from disclosure. The Administrator is responsible for developing guidance for the determination of �structurally descriptive generic names� when there are claims for protection from disclosure of specific chemical identities. There are also exceptions to protection from disclosure. If disclosure of information is required for a specific Federal law enforcement purpose relating to protection of health or the environment, it must be disclosed to an officer or an employee of the U.S. upon request. If disclosure of information is required for satisfactory performance of a contractor for a contract with the U.S., it must be disclosed to a contractor of the U.S. and employees of that contractor. The next part is a bit complicated, as it pertains to non-emergency disclosure of information, so I put it in a graphic form for simplification. There is one sneaky element of the regulation in 2604(f)(5) entitled �Workplace Exposures.� I have copied it below in its entirety. I�m curious about the language �to the extent practicable� and why the U.S. Environmental Protection Agency (EPA) Administrator is planning to make determinations to prohibit, restrict, or otherwise address workplace exposures, when this is the purview of the U.S. Occupational Safety and Health Administration (OSHA). The siloed nature of environmental (U.S. EPA), health (divided between U.S. EPA and OSHA and several other agencies), and safety (U.S. OSHA and several other agencies) regulations make it difficult for practitioners of occupational/environmental health and safety to fully understand compliance.